We are nearly half way through 2011 so you might have already started planning for 2012. This easy to read one page Excel calendar has the whole of 2012 on one page, with a good sized box for each day of the week – each day has five free cells for your use. It has the week numbers down the side – the week numbers are written according to ISO 8601. If you work in a company and your projects are planned in terms of week numbers it can be very useful to have a calendar which lists them. I’ve frozen the days of the week lables at the top so they are always visible, and the months are alternately coloured to make it easy to see which month you are on. There are two versions of this spreadsheet, one saved using the newer XLSX format, and one using the older Excel 97 compatible XLS format. Both file types can also be loaded in the free OpenOffice Calc spreadsheet if you don’t have Microsoft Excel. I also have a one page calendar for 2012, and a staff holiday planner for 2012 if you are looking for a slightly different calendar. If you work in a company then you may find yourself dealing in week numbers rather than dates. E.g. the deadline for this project is week 38! 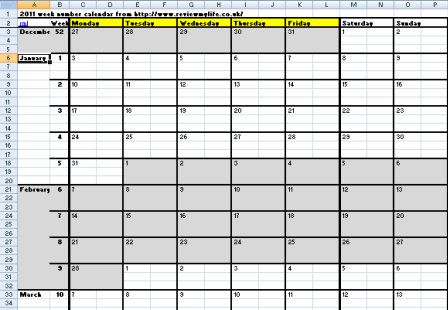 Here is a free downloadable Excel calendar for 2011 that has the days of the week across the top, and then the week numbers for the whole of 2011 down the side. Each day has five boxes for you to write in, and the days of the week are frozen at the top, making it easy to see which box is for which day. I’ve saved two versions. One standard version for modern versions of Excel (2007 and above), and an older version which should work in Excel 97. 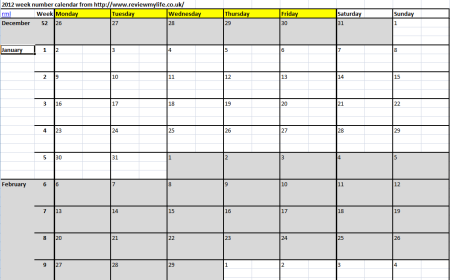 If you prefer a month by month view of the year then I also have a one page 2011 Excel calendar on this site available for free download as well as a calendar for 2010.